Cycle infrastructure progress in 2018 Edinburgh looks set to be somewhat frustrating, with an ambitious bike share scheme and several modest cycle schemes, but no physical work yet on the ‘big 3’ flagship infrastructure projects. During 2018 the Council’s ‘big 3’ onroad segregated infrastructure projects will all be in planning and legal stages, with work on the ground unlikely to start before 2019. Much as we, and indeed many councillors, are desperate for work to begin, the unavoidable legal, planning and public consultation processes are unlikely to be completed till late 2018. MGS and WEATN, in particular, were only approved in late 2017 (in the Community Links Plus competition) and so planning is only now starting. Fortunately the Sustrans cash which is 50/50 funding all 3 projects can be used towards staffing as well as construction. This should help expedite the above processes and, by full engagement with local businesses, schools, etc, pre-empt the risks of heavy opposition which delayed and almost scuppered the Roseburn plans and did scupper major onroad cycle schemes in East Dunbarton and in Ayrshire. Ironically, the most significant segregated cycle provision to be built in 2018 is likely to be in Picardy area – if the Council approves the current ‘gyratory’ plans (with tweaks) at the big Picardy Decision Day on 25 January. Along with many other organisations, however, Spokes opposes these plans – the whole gyratory concept seems a throwback to the ‘car is king’ 20th century. 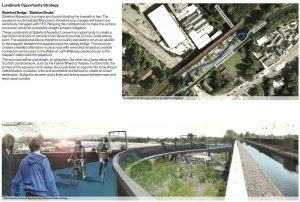 A simpler design, less attractive to motor traffic would allow much more pedestrian space and further improved cycle provision – but would mean a significant delay whilst new plans were prepared and consulted on. In Leith Street we continue to argue for the planned segregated cycleroute to continue beyond Calton Road and up to the Waterloo Place junction. 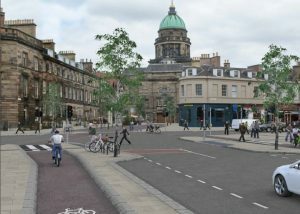 This will only be possible if the proposed 3 traffic lanes at the junction (1 northbound, 2 southbound) are reduced to one lane each way – a measure which would also allow a footway of decent width rather than the proposed 2-metre footway ‘pinch.’ This may only be possible if Leith Street is restricted to buses and emergency vehicles, a measure we also argue for. Even a one-way traffic ban should work, with southbound motor traffic turning left at Calton Road (as it does under the current temporary closure). In Leith Walk, extension of the relatively short new segregated provision is unlikely to be contemplated by the Council until the big autumn 2018 decision on tram to Leith and Newhaven. After that, segregated cycleroute extension to Picardy is promised, but extension to the Foot of the Walk will depend on campaigning by everyone concerned. Also in Leith Walk, we can expect ‘tweaks’ to improve the current segregated section, in the light of early experience. In particular, we hope to see rapid reinstatement of physical separation where the ‘orcas‘ were removed in late 2017. Despite many complaints at the time of removal, we appreciate that the Council was right to remove the orcas – they were not very visible, there were some pedestrian trip-ups near the main traffic flow, and one orca was thrown onto the footway by a car. Either the location was inappropriate or the layout/design flawed. Much of the adverse publicity about orca removal could have been avoided had the Council made clearer that the details of the whole scheme were experimental, that tweaks were and are expected, and, at the time of orca removal, released details of the problems. We are hopeful that their replacement will be far more visible and effective. A major issue in 2018 will be tram extension planning – a detailed plan is to be drawn up before the big yes/no decision in the autumn. The experience of the existing tramlines shows it is vital to get cycling (and pedestrian) aspects correct from the start, so Spokes hopes to have the tram extension as the topic of our Spring public meeting. 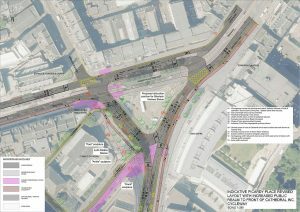 Segregated cycle provision the whole length of Leith Walk is vital, and there will be many issues beyond that – not least Constitution Street, where a tram stop is planned in the narrow section near the Foot of the Walk. For the existing tramlines, phase 2 of tramline safety measures is expected in the Spring and phase 3 (subject to legal orders being approved) in the Autumn. Whilst very welcome, the need for these measures would have been much less had the original layout of the tramlines taken better consideration for other road users, especially bikes. 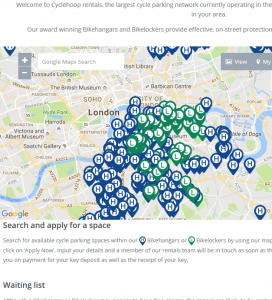 We are expecting a big bike-share scheme to be launched at last, and after all the hints in 2017 [e.g. see page 3 here and a Scotsman article here] it will be a huge disappointment if it doesn’t happen. With Edinburgh well behind other cities on this, it is encouraging that the hints are of an ambitious scheme which will include electric bikes. Also long overdue is a roll-out of the Council’s onstreet secure bike storage project. Any further delay would be extremely unfortunate given the massive demand which the Council itself identified long ago during its seemingly never-ending pilot scheme. London has demonstrated that a widespread and user-friendly scheme is perfectly feasible and need not involve the Council in extensive bureaucracy. Cycleroute connections – ten or so schemes were consulted on in 2016/17 to link up existing routes, and several of these should be constructed in 2018. As most of these are being handled by consultants AECOM the staff time for the Council cycle team should be relatively small. Most of these projects can be found under ‘Consultation Reports’ here. Some connections, such as at Lower Granton Road, will make a real difference to safety, pleasure and enabling people to make longer traffic-free journeys. Marchmont to Kings Buildings – another delayed project, again due in part to staff leaving. This is a relatively modest scheme compared to the Big 3, but easier to implement, with tougher onstreet parking restrictions, advance cycle lights at Blackford Av junction, and new cycle lanes. Roslin-Shawfair – the existing Roslin to Lasswade Rd offroad path will be extended by 3km to Shawfair, near the Borders Rail station, an area planned for many hundreds of new homes and other developments. Opening early in 2018, this route is we believe entirely Sustrans-funded, under the government’s Sustrans/NCN scheme, not from the Council’s cycle budget. North Edinburgh path network – Significant work to tackle drainage problems, some resurfacing and access improvements. Onstreet short-stay bike parking – installation of Sheffield/Edinburgh-type racks should continue. Emails to councillors asking about the long-delayed Princes Street parking would be welcome! Surprises – There are usually a few surprise projects from non-Council bodies. It would, for example, be great if some of the towpath improvements in the recent Scottish Canals report went ahead. Information about most Council cycle project plans can be found on these two web pages: Cycling and Walking projects & Cycling & Walking. Unfortunately both pages, especially the first, seem seriously out of date, particularly in respect both of dates but also of plans. The Active Travel Action Plan is to be revised in 2018, and we expect a greater emphasis on segregated onroad provision. Potentially most important of all is the City Centre Transformation Project, which could herald a massive rethink on the city centre during the lifetime of this council – or could end up as another great idea which flounders and disappears under a host of pressures, councillor weakness and token gestures as happened with Edinburgh’s Gehl report back in the early 2010s [see para 1102 here]. It will greatly help if individuals keep telling councillors what they want to see, and asking them to fight for bold decisions. Although Edinburgh is still way ahead of Glasgow for cycle usage levels, Glasgow now has a lengthy onroad segregated cycleroute, another under construction in 2018, an expanding bike-share scheme, a City Deal supporting big city centre walk/cycle improvements (unlike Edinburgh’s City/Region deal), work starting in Sauchiehall Street, and an ambitious City Centre Connectivity Commission (under former Edinburgh Transport Convener Prof David Begg) matching or perhaps going further than Edinburgh’s above Transformation Project. 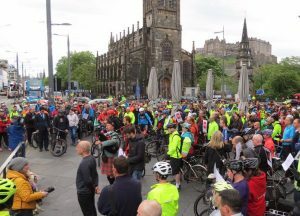 In summary – Edinburgh needs to look seriously at its cycling laurels if Glasgow is not to steal them! Retweet the tweet of this article.